Q Why do you call your Online Ministry, the No Walls Ministry? What did Jesus do? Jesus traveled about sharing the joy of His Father and His Kingdom to those who were available to him. He spoke to the masses and individuals wherever they were. Jesus, sent his disciples out into the world to do the same. Q What beliefs do you have? I am a Christian……….and an Ordained Minister. The No Walls Ministry – Online Ministry will not ordain someone as a Wicca Priest or a Druid, whatever that is. This is a Christian Ministry constructed to do service to and for Jesus. There are plenty of other sites where you can become an Ordained Minister and get those Ordinations. Q Without a building, would I really be an Ordained Minister? Definitely, Jesus told for us to go forth and spread His word. Jesus had no temple. 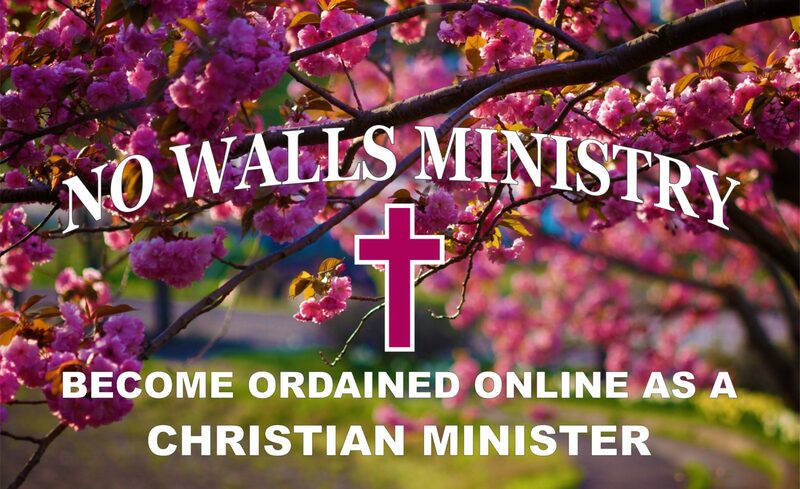 Q If I become Ordained in the No Walls Ministry will I be a Wedding Officiant? Yes you will. You will be entered in the World Wide Registry. You will be able to legally perform weddings and many other Ministerial functions in all 50 States and most of the world. You will have to check your County, and State’s laws to see if any other licenses are necessary prior to performing a ceremony. When applying for a Minister’s License (Ordained Minister), look into your County and State laws to see if you need a Letter of Good Standing. I am also a realtor and have had the pleasure of handing the keys to the home to many first time buyers saying, “You just bought a home”. It always gives me a thrill to see them so happy. Nothing prepared me for the emotions that I experienced when I said for the first time, “You are now man and wife.” Just wonderful! Q How do I become an Ordained Minister? A few steps. You must be moved to do so by the Spirit. The Spirit moves us all in different ways, some may just wish to perform weddings. That’s fine, but you can do so much more. You must be repentant for past sins and plan to do better in your life. Consider confessing your sins. Q What rules do you live by? I try to live my life by following the Golden Rule. Do onto others as you would have them do unto you. This simple rule envelops many the 10 Commandments and pretty much all of what is considered decent in society. And, of course, I try to follow the writings in the scriptures. Q How long is my Online Minister Certification good for? Forever! I believe milking a member year after year like so many other Online Ministry sites, is not in following with the Golden Rule. Q Rev. I am a sinner, a real sinner. Can I become Ordained? I am a sinner as well, a real sinner! However, I try to live my life daily in the way that Jesus would approve. Are you repentant of your sins? Will you work to change your sinful ways? – If so, then yes, you can be Ordained. Q I don’t know what I really believe. I think there is a God, but I’m not sure. I believe that God understands the failure of many of us to question His being. Pray for Grace. Ponder this: Without doubt, there would be no faith. Q What other Certifications does the No Walls Ministry offer? Can I become a Pastor? Can I be a Priest? Several – You can be a SUPPORTER, you can become a MEMBER of the Church, you can become an ORDAINED MINISTER. You can even earn a MASTER of Divinity Certification, BISHOP’S Certification, or a DOCTOR of Divinity Certification. These take more time and effort of course. If you would like to have a certification of Pastor or Deacon, Evangelist, send a message along with your request. We will respond with a confirmation if this is an issue. Q What is included in a basic Minister’s packet? Please follow the links below to see the beautiful packages you will receive. Q Don’t I need a Theology Degree in order to be ordained? No, Ordination simply requires your desire to serve God and having an accredited Ministry provide the title. A Theology Degree requires studies at a University or other approved School. Q Can I get personalized BUSINESS CARDS with the No Walls Ministry logo? Yes, you can order them from our store or depending upon the Level of Certification. Q Do you have other items available? Q Will I automatically have tax exempt status? No, that has to be done by application through your State and the Federal Government. Be careful, as becoming tax exempt, certain laws will apply to you that you should be aware of. Consult an Attorney. Q How do you become an Ordained Minister? Is a Wedding Officiant the same thing? How to become a Minister Online? All these are the same thing. An Ordained Minister can legally perform wedding and much more. Becoming an Ordained Minister is a very simple process. After you have reviewed the different levels of Minister Certifications you can choose which you prefer.